For the first time in the war against ISIS in Syria the US has attacked Syrian government forces with the downing of a Syrian fighter jet by a US fighter jet, which was reported to have been defending US-backed coalition forces battling ISIS. Also, a new player has entered the war. Iran! For the first time in the conflict, Iran conducted a missile strike against ISIS in retaliation for a terror attack in Iran that killed twelve, which ISIS claimed credit for. I can no longer keep track of who is fighting who in Syria and exactly where their allegiance lies. The situation is now half past bizarre. Russia backs Assad. Iran backs Assad. The US backs rebel forces. Assad is fighting ISIS. Russia is fighting ISIS. The US is fighting ISIS. Iran is fighting ISIS. Now, all of those parties are fighting each other for attacking the rebels, who are also fighting ISIS, as well as Assad. ISIS is fighting everyone. Our resident geniuses at the Powdered Wig Institute for Wartime Safety think tank have designed a simple schedule which will save lives and other resources. Trump, Putin, Assad, Ayatollahs, et al, you can all thank us later. Parties in the war may only operate offensively and defensively on their assigned days. And unlike 24/7/365 wars of the past, our war plan comes with ample time off. Even ISIS enjoys a three-day weekend! Friday…. Maintenance and planning for the coming week. No fighting allowed. Saturday…. Multi-culture day. All forces meet at pre-designated location and party hearty. No fighting allowed. Sunday…. R&R. No fighting allowed. As reported by The Washington Times, the American shootdown of the Syrian jet took place near the Syrian town of Ja’Din, located south of Tabqa dam, the coalition’s main logistics and air support hub for the ongoing assault to drive the terror group also known as ISIS or ISIL from their self-styled capital of Raqqa, according to a Pentagon statement. “Pro Syrian regime forces” had launched an attack on Ja’Din Sunday afternoon, retaking the town from the Syrian Democratic Forces, or SDF, the network of Arab and Kurdish militias tasked by the U.S. coalition with liberating Raqqa. U.S. warplanes carried out several low passes over the Ja’Din, halting the attack by forces loyal to Syrian President Bashar Assad. It remains unclear whether the regime forces that led the assault on Ja’Din were government troops or Iranian paramilitaries sent in by Tehran to support the regime. After the assault on Ja’Din was turned back, a Syrian-flagged SU-22 fighter launched airstrikes on SDF fighters retaking positions inside the city. 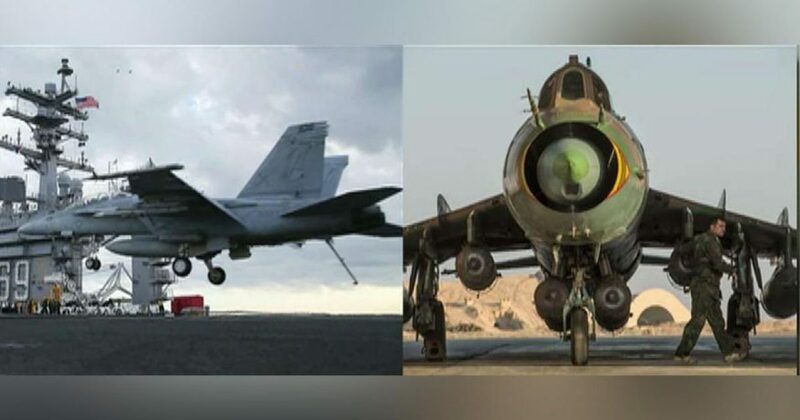 An F/A-18 Super Hornet was sent to take out the Syrian warplane, which it did, “in accordance with rules of engagement and in collective self-defense of Coalition partnered forces,” according to the Pentagon. “The Coalition’s mission is to defeat ISIS in Iraq and Syria. The Coalition does not seek to fight Syrian regime, Russian, or pro-regime forces partnered with them, but will not hesitate to defend Coalition or partner forces from any threat,” the Pentagon said Sunday. The Syrian strike was the second attack on coalition forces by pro-regime fighters this month. A foreign drone purportedly bombed a patrol outside the At Tanf camp last Tuesday. The camp along the Syrian-Iraqi border is being used by U.S. special operations military advisers to train Syrian militias to battle Islamic State in Raqqa and beyond. The Russia- and Iran-backed Assad government is at war with both Islamic State and the militants backed by the U.S. The Pentagon confirmed at the time there were no casualties from the attack on the patrol but would not comment on whether the drone was operated by the Syrian armed forces or another foreign military. But Iranian-backed forces have attempted to breach those areas repeatedly over the last several weeks. Last Thursday’s drone attack came as American fighters launched airstrikes against Iranian forces trying to cross into the zone. Tehran has taken an unprecedented role in the fight against Islamic State since the terror group claimed responsibility for a series of spectacular attacks in the Iranian capital. The series of shootings and suicide bombings that struck the Iranian parliament and the shrine dedicated to Ayatollah Ruhollah Khomeini in Tehran by the terror group on June 7 left 12 dead, 42 wounded and roiled the Middle East. On Sunday Tehran launched a series of ballistic missile strikes against Islamic State targets in eastern Syria in retaliation for the attacks in Tehran, state-run media outlet Tasnim News Agency reported. The midrange ballistic missiles targeted Islamic State enclaves near the Syrian city of Deir-e-Zour, where a number of the terror group’s leaders — reportedly including Islamic State emir Abu Bakr al-Baghdadi — have fled ahead of the Raqqa offensive. The missile strikes hit the “headquarters and gathering centers of Takfiri terrorists supporting and building car bombs,” a statement by the hard-line Iranian Revolutionary Guard Corps broadcast by Tasnim said Sunday. If confirmed, it will be the first time the Iranian regime has taken direct action against Islamic State in Syria.